Some pictures of my orgonite pendant necklaces. 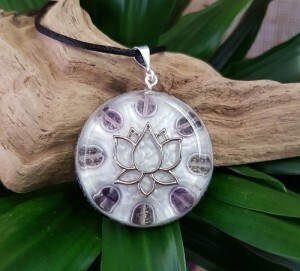 All the pendants are made from metal shavings, crystal quartz, selenite and ormus, with added gemstones. They are all handcrafted with loving intent and care. Wearing an orgonite necklace is a great way to constantly feel the positive effects of orgonite. Since it is constantly in contact with your body, your energy is constantly being cleansed and brought back to its original, balanced state. They can be a great tool for meditation and enhance your spiritual growth. 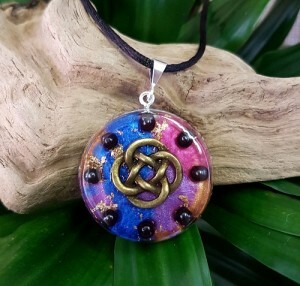 Orgone necklaces can also provide a lot of relief if you suffer from the effects of EMF. While it’s still a good idea to have larger pieces in your home environment (e.g. 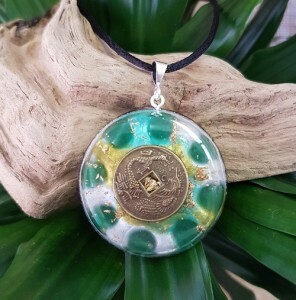 an orgonite pyramid by your computer or TV), orgone necklaces work well when you’re on the go. If you would like to read more about different crystal healing properties, you can do so on this page. How do I take care of my Orgonite Necklace? 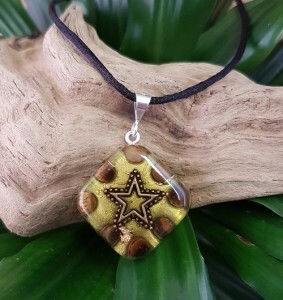 Orgonite necklaces do not need to be cleansed or charged like crystals do, however if you wear it a lot, you can give it a boost by holding it under running water (wearing it in the shower works! ), by cleansing it with sage or similar incense, or placing it in contact with the earth under moonlight. Orgonite necklaces should not be submerged under water for long periods of time, as this may affect the resin. They should also not be placed in direct sunlight for long periods of time, as this may bleach the crystals inside it. 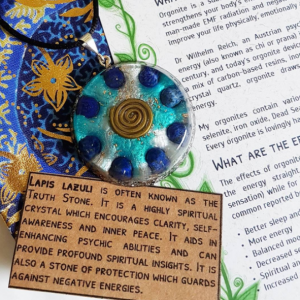 What Effects will I feel from my Orgonite Necklace? Some people feel the energy of orgonite straight away, while for others, it is more of a cumulative effect. Some of the initial effects may be a warm or tingling sensation, an increase in energy, and more vivid dreams. Like crystals, orgonite works best with intention, since it has a sort of consciousness and is affected by your intent and thought. You can imbue your orgonite necklace with intention by meditating with it and focusing on what you would like it to do for you. This does not have to be done for long periods of time, but the more frequently you do it, the better. It’s a good idea to start each day with a couple of minutes of imbuing your necklace with your intentions for the day. Where can I buy Orgonite Necklaces? You can see all of my orgonite necklaces for sale here. All orgonites are made by myself, and shipped from London, UK. I ship worldwide, and all payments go through Etsy, the largest and most trusted marketplace for handcrafted goods. You can read more about my shop and process on this page.